New Admin – An Inside Look! You either love change or hate change and there's not much in between. So, at AmeriCommerce, we figured why not go all in? And that's just what we did with our new and totally re-imagined admin console. So, brace yourself for one giant leap forward - completely re-thought and absolutely improved. While the change is dramatic, we don't take all the credit for the inspiration. You guys, our customers and prospective users, have been telling us for a while that you wanted a new admin and what you wanted in it – and here we are. This beta release of the admin is fully featured and available to both new users and current users by upgrade request. 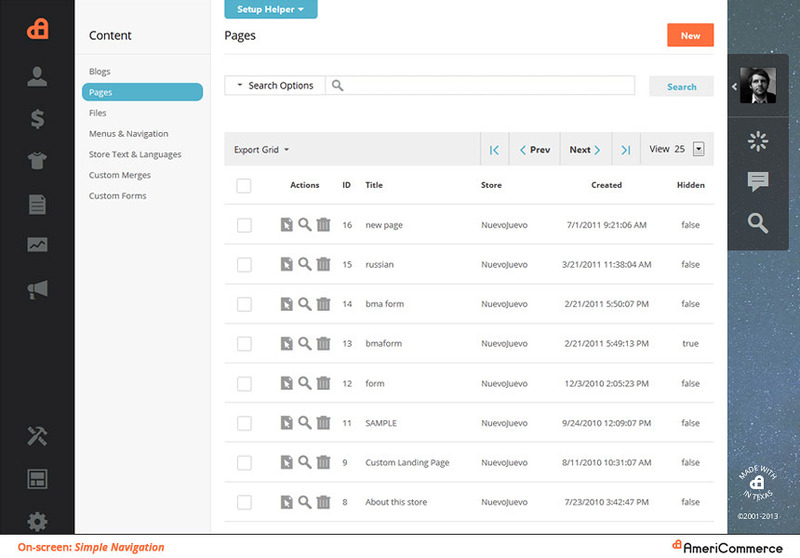 Dive in faster and manage your store quicker with this intuitive, clean, and easy to use admin console. Not only do the pages load faster, they are also easier to use and understand. You'll notice special attention placed on design and UI/UX patterns making the app easier to learn and embrace. The navigation, content areas, viewing and editing controls are all standardized so you can easily predict what's behind every click. Advanced users can find additional tools with one simple click of the "more actions" button allowing all same power just without all the visual noise. Beyond the layout and structure of the admin, you'll find a simple color palate that helps guide and inform your steps along the way. The primary action for each page is now illustrated by one singularly orange button so you'll always be clear on the primary purpose of the page you are on. And, in general, you can look for the color blue to help you dial in on your active selections, useful information and helpful navigation. By using a consistent UI pattern the admin area is much easier to use and understand providing a far greater user experience. Adaptive design for tablet friendly or desktop friendly layouts. Concise visual areas with clear purpose. Easily accessible help text, overview information, and setup helper. Access to powerful features and tools without a lot of visual noise. A simple navigation is no easy task with an ecommerce app like AmeriCommerce with features and tools that range from marketing to order management, shipping to taxes, and from design to customer management. 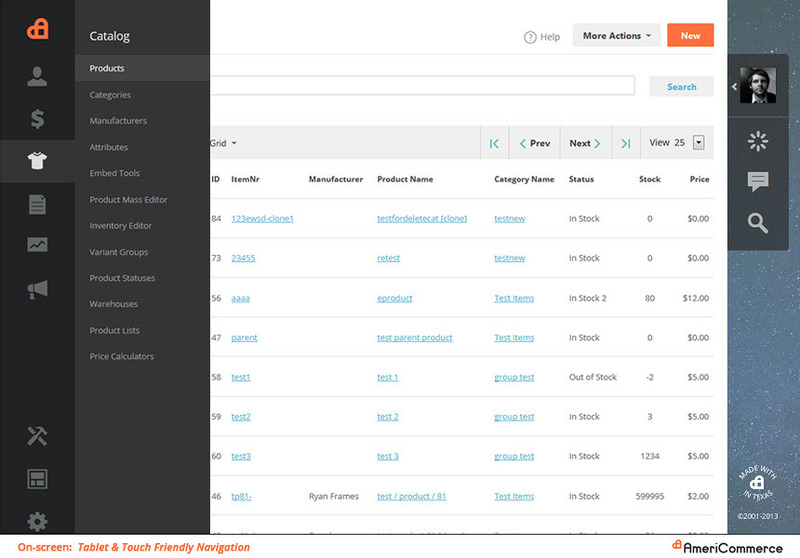 Even still, the new admin consolidates sections and greatly improves how quickly you can get to critical areas of your store. 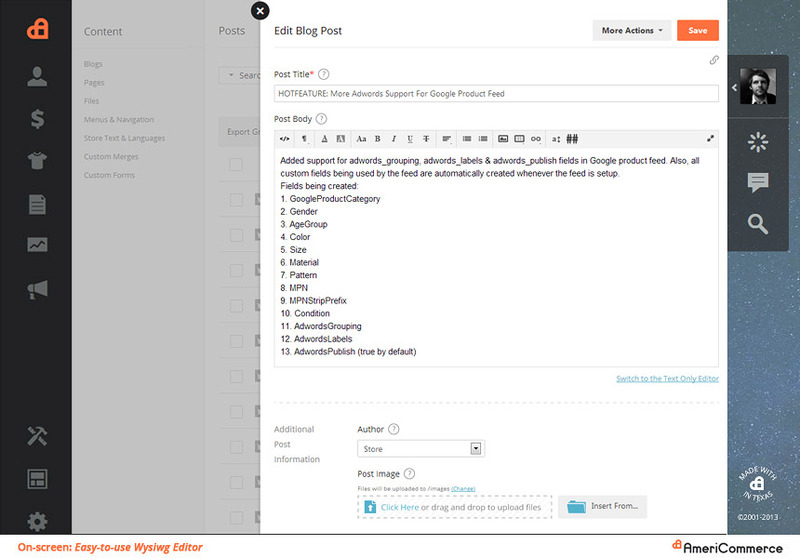 In fact, now you can get to key areas of your admin within just a few clicks. The new approach to navigation makes it easier to familiarize yourself with your store tools along with the main sections of the app. It also means you’re less likely to lose context of where you are in the system as you manage your store. It’s never been easier to feel at home and be clear on where to go for all your store management tasks from customers to products and settings to themes. Simple Navigation with fly-out menus for the primary sections of the app. Easy to use sub-menus within the primary sections. Reduced “jumping” of sections via new “in context editing” menus. Touch friendly navigation and retina friendly icons for tablet users. Cool New Tools and Capabilities! 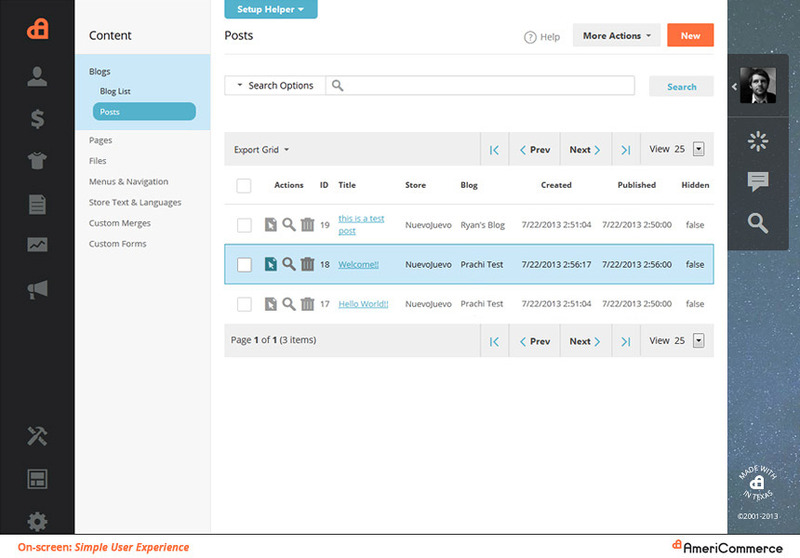 Along with the new and intuitive design come some really nice additions to the admin experience. 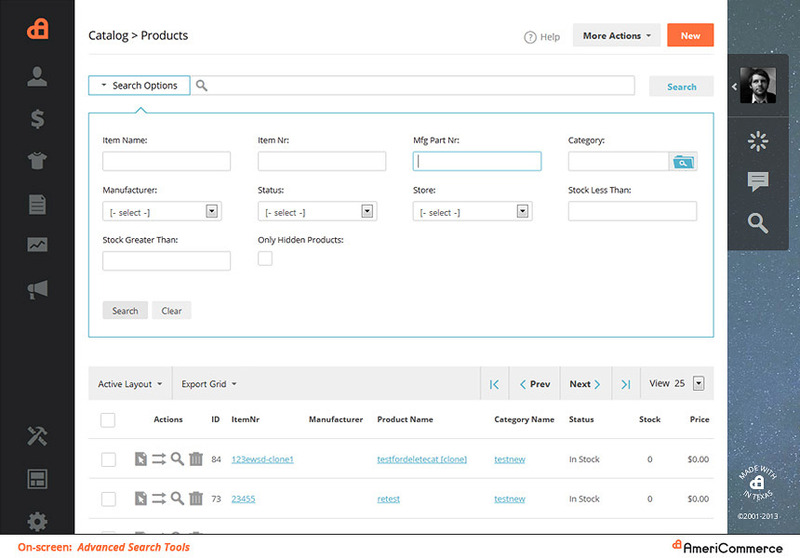 Now you’ll be able to manage your store more effectively and easily. Look in the slides above for these 8 new tools and capabilities! Customize your dashboard with any of the pre-configured dashboard widgets with sales data, visitor data, and a lot more. You can drag and drop dashboard widgets in any location you prefer and easily add more widgets or remove widgets from your dashboard to make it fit your needs. 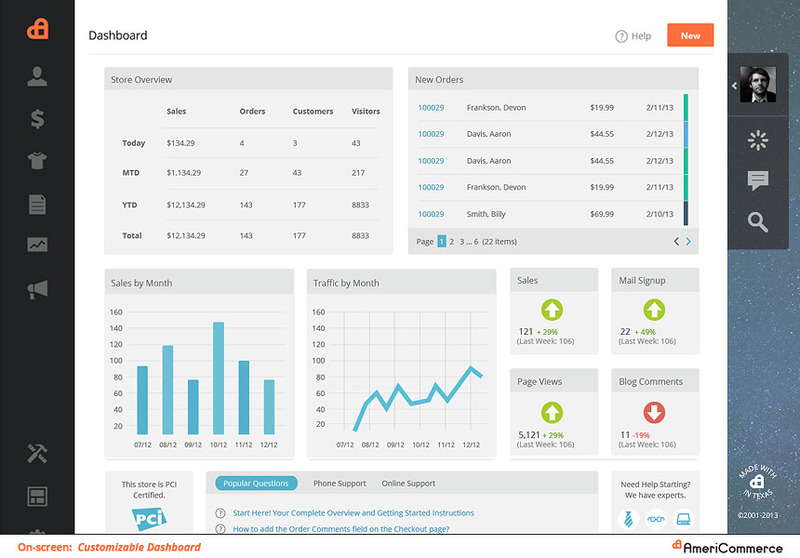 Your dashboard is now a useful springboard into sales, orders, trends or big picture reporting. Throughout the app, you can edit, add new, or view more information without leaving the page you are on via a handy slide out editor. While it may seem trivial, this new feature dramatically accelerates your store management and ability to enter new information or edit related information based on the task at hand. 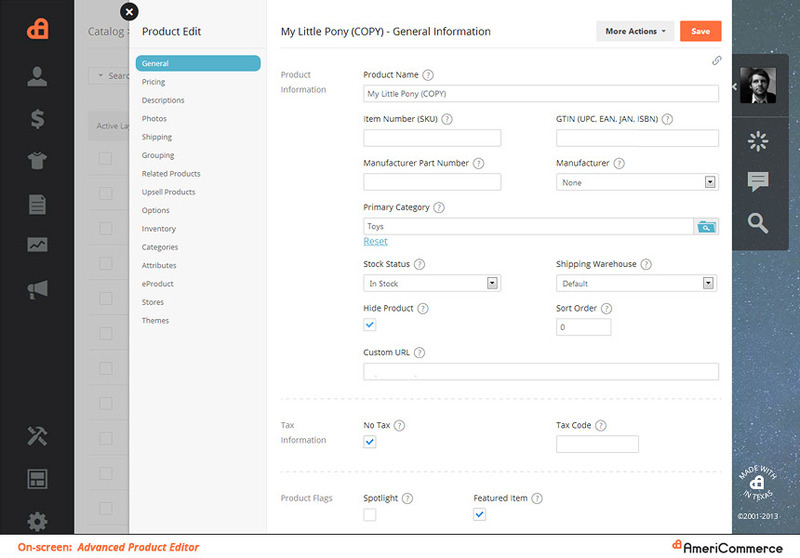 For example, easily add a new order while viewing details on a customer or create a new category while editing a product – all without leaving the initial page you were on. 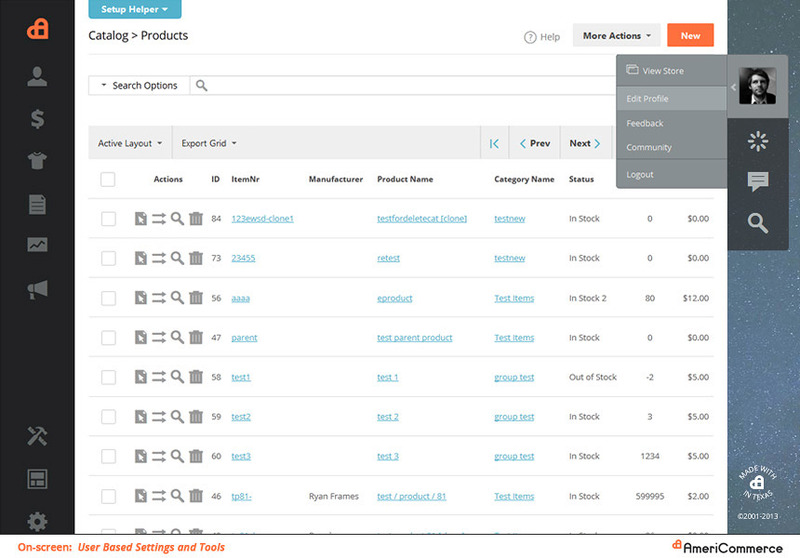 Highly visible search tags now easily show the things you have searched for and allows you to quickly clear individual search terms on every listing page in the application. 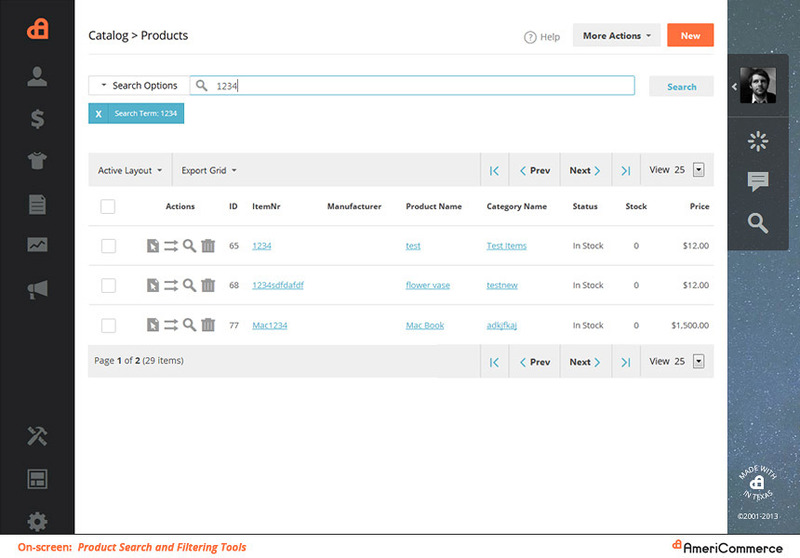 These pages can also now be searched via multiple filters to help you find the items you need. 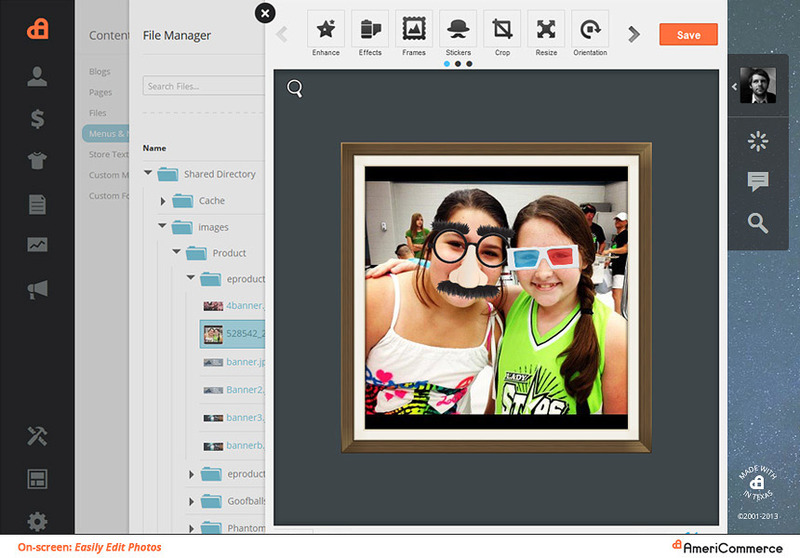 Tweak, enhance, crop, colorize, and manipulate photos directly in the app using Aviary's integrated photo editor. With the new WYSIWYG editor you can easily format, align, and style text and content in various area of the app. And if you use custom merge codes, you can click the “insert merge code” button and select the merge code you want to use in the content of your post – all within the simple WYSIWYG editor. 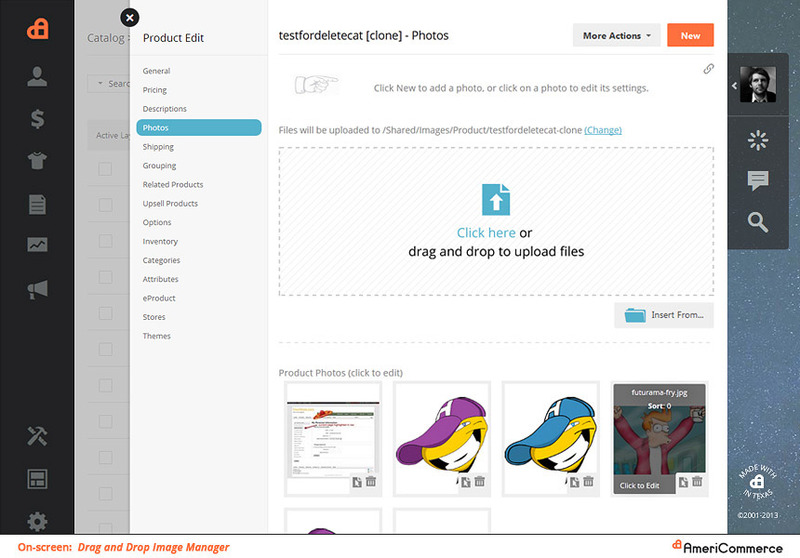 Managing the files and folders on your store has never been more simple, yet powerful. 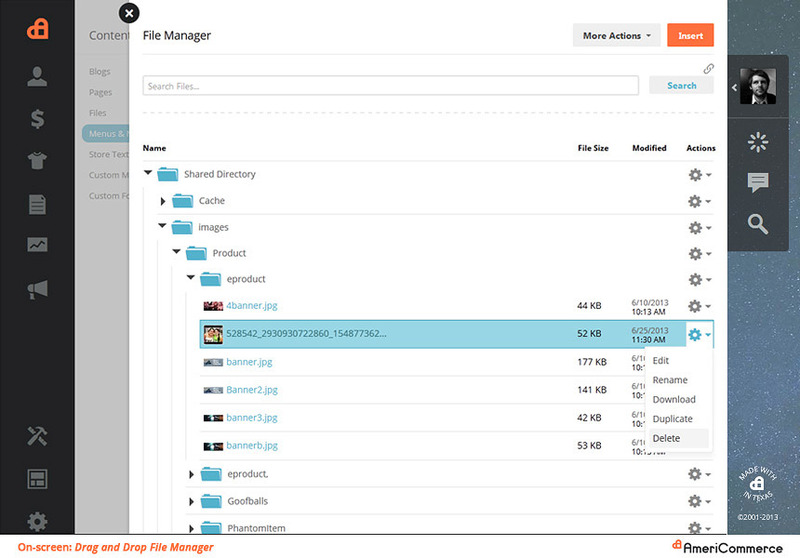 Easily move files and folders within the new file manager. The new file manager makes it easy for you to navigate your files, change location of files, edit files, download files and add new files to your store. Now you can drag and drop files from your computer for easy uploading or simply browse your hard-drive or pull from an online location. Uploading files is fast, secure and visually enhanced! 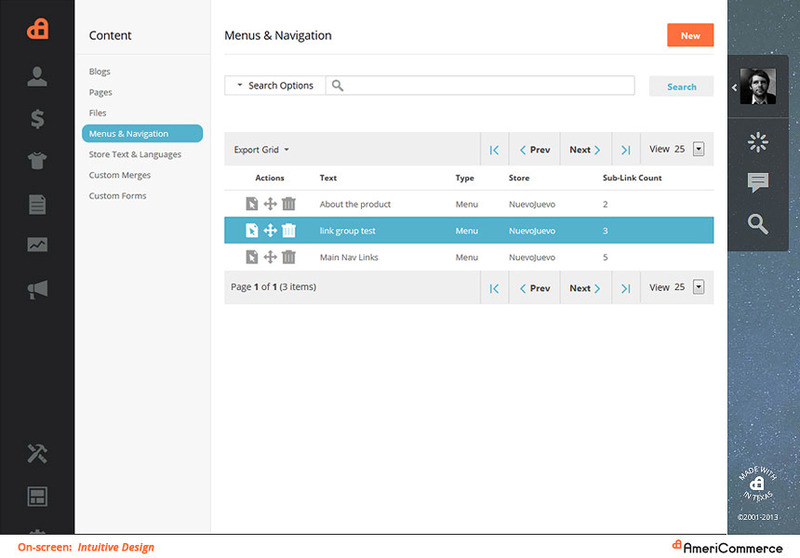 When building your site navigation, use the new menu builder to create primary navigation menus, sub-menus and more. 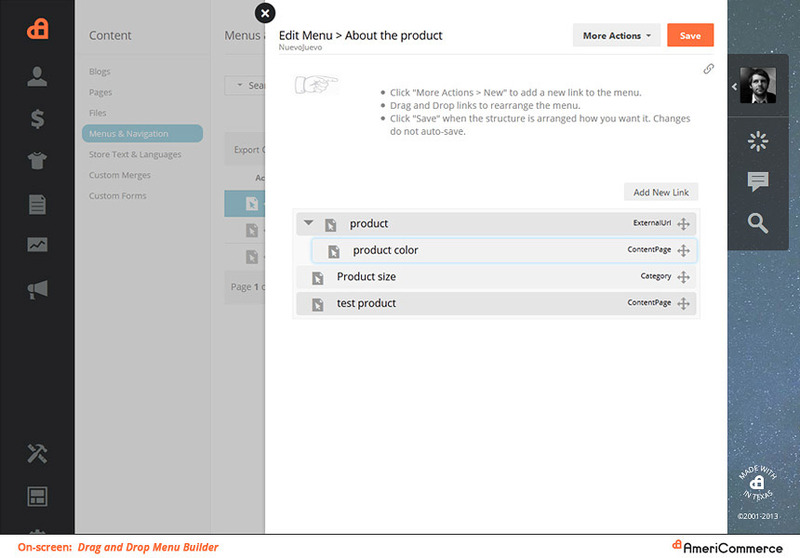 The new drag and drop menu builder lets you easily manage and modify your menu structures within an intuitive console that is a replica of the menu you see on your site, just drag the menu items where you want them to be! Are You Ready for the New Admin? With these changes, the AmeriCommerce admin becomes faster, easier to use, and adaptive for desktop and tablet users. Along with the addition of new features, all the same great features for running multiple stores online, Facebook shop, embedded ecommerce tools, and all your order and customer management become even easier to use. If you’re a current customer or prospect and you’re ready to see the new admin in action, simply email us at supportrequest@americommerce.com and ask for it! We’ll provision a store with the new admin just for you! Having been an AC customer for 7 or so years, I have seen the platform change significantly (always for the better). This new admin is one of the best performances enhancements for the admin side AC has ever put out. During my beta-testing I have created a storefront from scratch entirely in the new admin (regions, rules and all except for my bulk product imports). The administrative functions involved in the admin side of AC have been tweaked to enhance the workflow, minimizing clicks and and time, and maximizing operator efficiency. This new admin is fast, fast fast. Is the new admin only available for new stores being provisioned or will it be incorporated into existing stores as well? @Shawn: It's being prepped for new stores first over the next few weeks. As for existing store owners, yes they will absolutely be getting it. The question is more when and that depends on many factors. The best thing to do is to grab trial site, let us update you to the new admin beta so you can play with it, then figure out when best works for you to be upgraded. Know that we fast approach the holiday season, so we are very careful of major updates during that time, so as we get closer the filter we decide by may tighten. Of course, I say all of this is basically best practice, customers always get what they demand at AmeriCommerce, so if it's something you just have to have, well that's where we all just chat and decide when and how and get it done! Hope this answers your question! Happy selling!! It's been about 2 weeks since my last comment. I've seen AC push out more and more tweaks to my install, addressing everything from 'broken' items to efficiency and workflow improvement. My enthusiasm for this new version has only grown since I've been using to develop some new sites. Congratulations on the new version! It looks as if you took the input of your customers and put it to work! BRAVO! @Brian - That's great news! Glad to see continued excitement. Some of these current items are really cool tweaks and improvements aren't they?! Thanks for keeping us updated Brian! I just got Beta admin... Yes, the interface is cleaner, lighter, more attractive, and more familiar to, e.g., a WordPress user... Everything related to a subject, e.g., Themes, seems to be together in one place, making the interface easier to learn and use... I don't know if it is faster. I just moved from the city to the country and dropped from 18 mb/s to 6 mb/s download speed. However, I don't notice a slowdown... It is definitely faster to interact with the interface. Keeping my cursor from moving off the menu and submenu lists was a big challenge on the old interface... It has not been a difficult adjustment. I easily found all the features that I was using before (after one phone call to Mallory ;) )... I haven't tried the competitors, but I expect that the UI/UX experience is now equal to any of them, and the features with AmeriCommerce are so rich and satisfying... Thanks for letting me in on this. By the way, I chose the color scheme for my site before I saw the new admin. They are almost identical. Any more on how and when the new interface will be migrated into existing stores? Just tried the email template editor and it is so much easier than the old style. 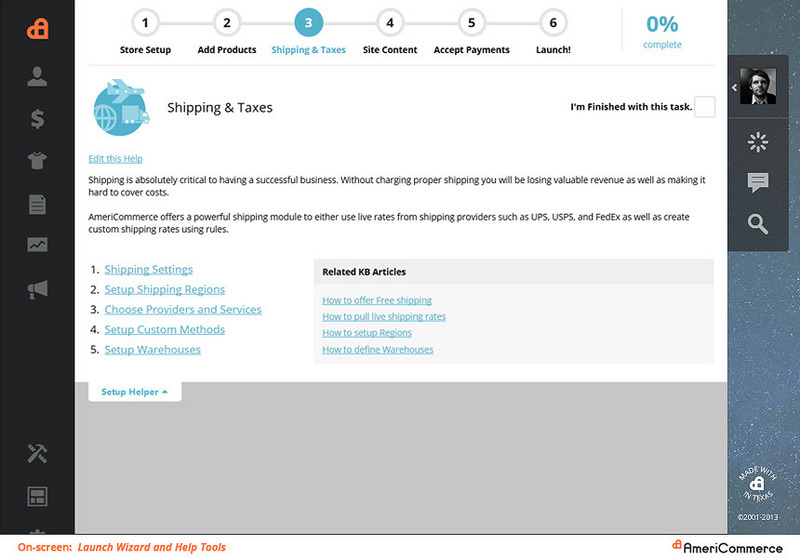 Simple, clean and easy to tweak to customize to your store's style. Nice Job. It's still kind of buggy, but I know you'll fix stuff soon.